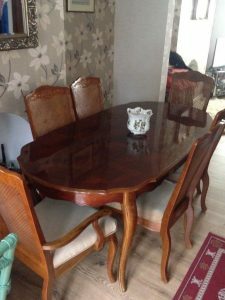 A vintage mahogany extendable dining table, together with six high back dining chairs, upholstered to the seats in cream fabric. 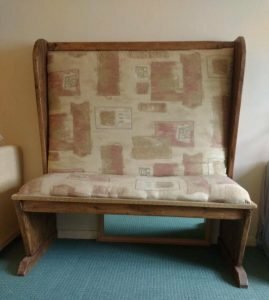 A two seater high back solid wood vintage sofa bench, upholstered in red and cream patterned fabric. 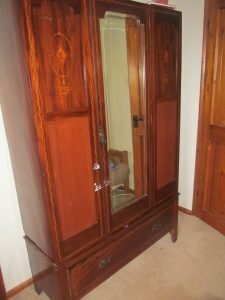 A tall standing Edwardian triple mahogany wardrobe, having a large oval mirror inlaid to the central drawer and a large drawer to the bottom. 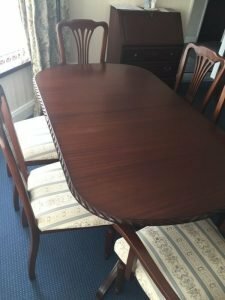 A vintage solid mahogany extendable dining table, together with six matching dining chairs, upholstered to the seats in cream and blue striped fabric. 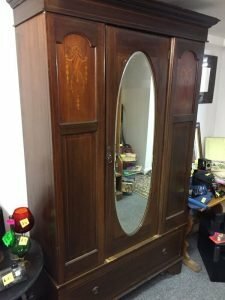 A tall standing solid wood vintage triple, having a large mirror inlaid to the central drawer and a large drawer to the bottom. 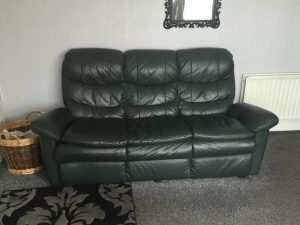 A three seater high back vintage reclining sofa on mahogany feet, upholstered in deep green leather. 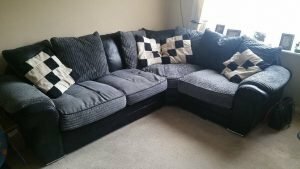 A four seater low back right hand corner sofa, upholstered in black faux leather and grey fabric. 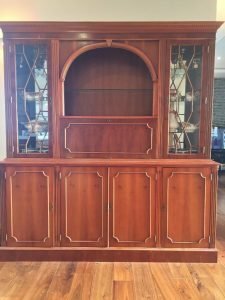 A tall standing solid wood vintage dresser, having a glass inlaid cupboard to the top either side of a pull down shelf, and three cupboards to the bottom. 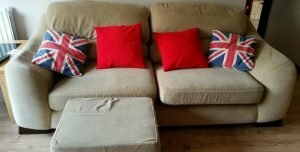 A two seater high back sofa on solid mahogany feet, together with a matching square footstool. 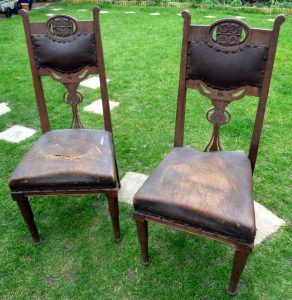 A pair of vintage heavily carved solid wood dining chairs, upholstered to the seats and backrests in brown leather. 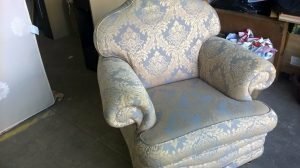 A vintage high back sofa on mahogany legs and brass castors, upholstered in pastel blue and gold damask patterned fabric. 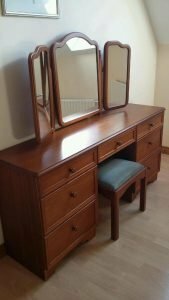 A vintage solid wood vanity dresser, having three drawers to either side of a central drawer, together with a matching stool. 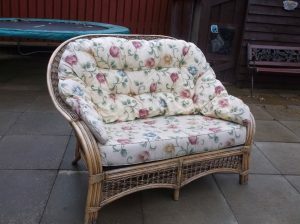 A two seater vintage high back cane conservatory sofa, upholstered in floral patterned fabric. 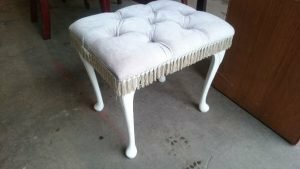 A hand painted white solid wood vanity stool, upholstered in white velour with button and fringe detailing. 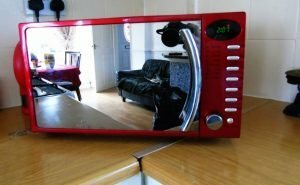 A metallic red mirror fronted Russell Hobbs counter top 500w microwave oven. 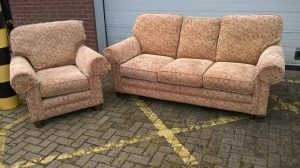 A three seater high back sofa and matching armchair on wooden legs, upholstered in diamond patterned fabric. 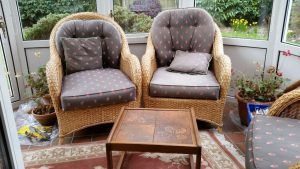 A four piece conservatory furniture suite, to include a two seater high back wicker sofa, two matching armchairs and a solid wood square coffee table. 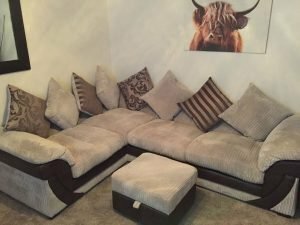 A four seater low back left hand corner sofa and matching square storage footstool, upholstered in grey corded velour and faux black leather. 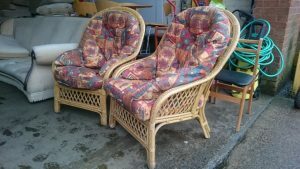 A pair of cane curved back conservatory armchairs, upholstered in colourful patterned fabric. 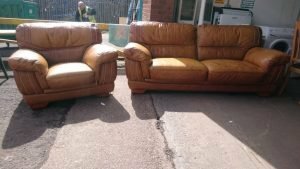 A two seater high back vintage sofa and matching armchair, upholstered in tan authentic leather.